The Saudi-led coalition in Yemen will offer $1.5 billion in humanitarian aid to the war-ravaged country in coordination with the UN. A further $2 billion will be granted by the Saudis to the Yemeni central bank to avert a currency collapse, in a country where three quarters of the population – 22.2 million people – need assistance. To help deliver the aid to the war-stricken population, seventeen safe-passage corridors will be opened up into the country to transport aid internally and an air bridge will ferry multiple flights of aid in each day – the first flights are expected to start later this week. 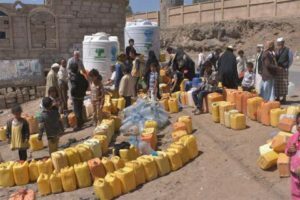 At the same time, Yemen is grappling with outbreaks of cholera – with more than 2,244 associated deaths reported in less than a year – and diphtheria. The conflict between the Shia Houthi rebels who took the capital Sanaa and much of western Yemen and the Saudi-backed Yemeni Government with control over much of the south and west has killed almost 10,000 people and left more than two million displaced. The UN says Yemen is the world’s worst humanitarian crisis, with about eight million people on the brink of famine. Written by: Peter Mulvany on January 23, 2018. Posted by Peter Mulvany on Jan 23 2018. Filed under Headlines, World News. You can follow any responses to this entry through the RSS 2.0. Both comments and pings are currently closed.